● Winter cycling: good idea or flat-out insane? The CBC website has an interesting article entitled “Winter cycling: good idea or flat-out insane?” Despite the headline, the article paints a positive picture about winter cycling, and it offers a number of worthwhile tips. The article also quotes Tom Babin, the author of the book “Frostbike: The Joy, Pain and Numbness of Winter Cycling”. Although I only got around to reading it recently, I can definitely recommend it for anyone who is interested in winter cycling. 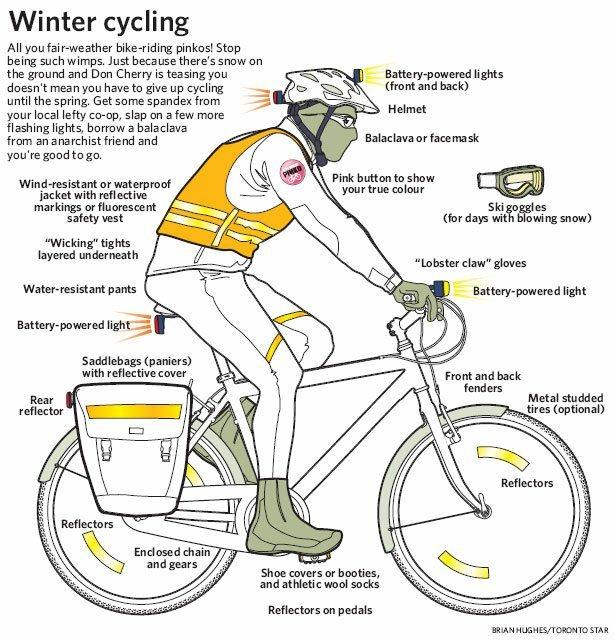 The accompanying illustration appeared in the Toronto Star a several years ago with an article about winter cycling in the GTA. It provides a great summary of how people might want to prepare themselves for winter cycling. 1 Comment on ● Winter cycling: good idea or flat-out insane? keep it simple is key! freewheel hub as cassette pawls will freeze beyond -5oC due to the viscosity of the grease used! use 26×1.95 or larger mtb tires. where clothing that wicks away sweat, built up sweat will freeze things, avoid freezing the middle portion of your body! it hurts! mitts that are flexible enough to maneuver quickly. boots that are waterproof! and ability to add layers of socks! get a really really crappy bike for under 100 bucks, sludge and salt eats metal! many things won’t survive winter. Plan your outing to avoid traffic, try to stay on the side roads to avoid the 3000lb creatures. Keep everything well lubricated with oil that has a viscosity for winter (-40oc – graffite based).